Dot Whetstone (A) patented some 40 years ago has never been matched despite being copied countless times. The first Diamond Honing Cone was made for Dave Powell’s dentist to sharpen curved dental tools and when he brought one to me in the UK around 40 years ago I introduced it into the woodworking world here for sharpening gouges. As you scroll down the page you’ll find the DuoSharp® range first and then the less expensive Dia-Sharp® range which still gives you far superior performance & longevity than any of the competition and may suit your budget better. And remember, you don’t always need a big surface area to be able to sharpen woodworking tools. As I tell hundreds of people at shows every year “If you can move it on diamond, you can sharpen it!” So if your budget is a bit thin, take a look at the 6” Dia-Sharp® Whetstones or the 6” DMT® Polka Dot Whetstones and perhaps start to sharpen the German way! (They sharpen in a circular motion by the way). 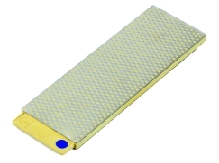 Double Sided Diamond Whetstone with a choice of grit combinations. 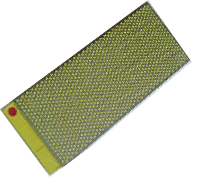 Size: 10" x 4" x 0.375" (250mm x 100mm x 10mm) available with or without a DuoBase™. 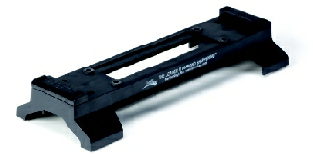 The ultimate Bench Whetstone sharpening choice has to be one of the DMT® DuoSharp® range. There is simply nothing else to equal the quality, precision and longevity of these fantastic Diamond Whetstones. 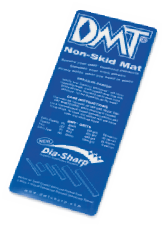 And taking these three most important things into account DMT® DuoSharp® Whetstones are not really expensive. When you compare the advantages they offer you they must be considered a very wise investment as they’ll give you many years of sharpening perfection and personal satisfaction. 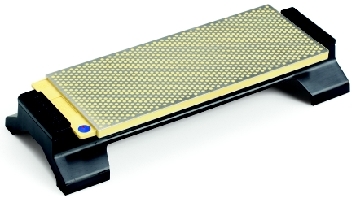 Double Sided Diamond Whetstones with a choice of grit combinations. Size: 8" x 2.625" x 0.375" (203mm x 67mm 10mm) available with or without a DuoBase™. DuoSharp® Plus has the advantage of continuous diamond at one end (on both sides) and is available in Extra Fine/Fine, Fine/Coarse and Coarse/Extra Coarse combinations. Note: In view of the advantage of the DuoSharp®plus™ Whetstones we do not stock and can’t see the point in having the same grits in the basic DuoSharp® models. area for small & pointed tools. DMT® Dia-Sharp® Bench Whetstones are made with the same care and with the same quality of finely graded mono-crystalline diamond as the DuoSharp® range above. They are precision engineered to a superior flatness than anything similar on the market and will outlast any of the competition to give you superb value for money. 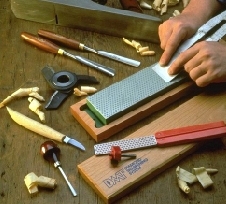 A continuous diamond surface has its advantages over the polka dot system when sharpening small and pointed tools or woodturning gouges for example but obviously the whetstones are much heavier if they need to be carried about. They are also less expensive to make. Other than the handy 6” x 2” size which are available double sided all the rest are single sided and come with non slip feet. 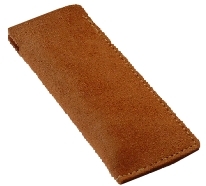 StarkieSharp offer Leather Sheaths, not only to protect the surface while in a tool bag but to use with our Honing Paste to give a fantastic polished finish to your tools without requiring any skill so that anyone can achieve superb professional results. 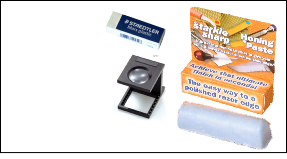 Look for the added value deals which include Honing Paste and an 8x Magnifier so you can study your edge before and during sharpening! Leather Sheath to fit your choice of Dia-Sharp® + Honing Paste to use with the Leather Sheath for that final polish + 8x Magnifier to check your edge and a Staedtler eraser to clean the diamond. Special price only valid at the time you buy the appropriate Whetstone and enter Promo Code. Otherwise you must buy these items singly. There are Leather Sheaths to fit all the Dia-Sharp® Bench Models. Lightweight, precision engineered and long lasting these Diamond Whetstones™ are still much appreciated for their superior performance over any of the competition. With a 35 year pedigree and their finely graded mono-crystalline diamond surface they out perform and outlast all the copies giving you consistent results for years. Once again, a DMT® Diamond Whetstone™ is a sound investment! 6” x 2” Dia-Sharp® Double Sided Whetstones. Choose one of these if you can run to it! 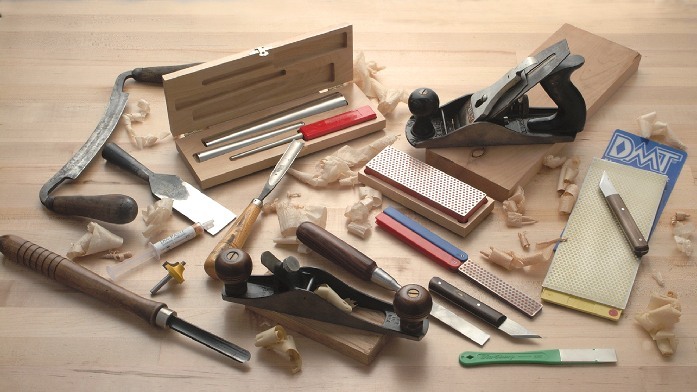 They are really handy and light in your tool bag with two grits for chisel and plane iron sharpening and ideal for woodturners, particularly with a Leather Sheath and Honing Paste. See the (Woodturning Page.) They are also very popular for axe sharpening with the amazing axe men we meet at shows. 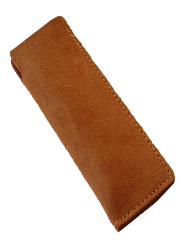 There is an optional Leather Sheath available. Measurements are above. Size: 6" x 2" x 0.25"
6” x 2” Dia-Sharp® Single Sided Whetstones. These are really handy and light in your tool bag for chisel and plane iron sharpening and ideal for woodturners, particularly with a Leather Sheath and Honing Paste. See the (Woodturning Page.) They are also very popular for axe sharpening with the amazing axe men we meet at shows. 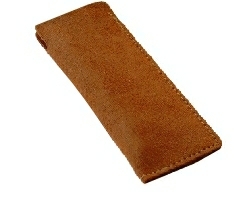 They come with Non Slip Feet and there is an optional Leather Sheath available. 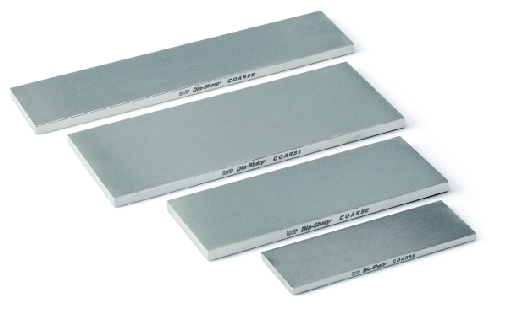 8” x 3” Dia-Sharp® Whetstones. Single Sided. These are very popular for those of you who want a large sharpening surface for chisels and plane irons at a budget price. They’re great for knife sharpening for butchers and chefs for example and what I use to repair knife edges at shows. 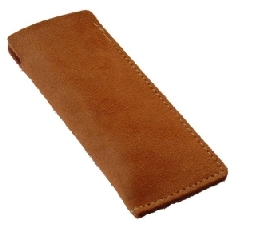 They come with Non Slip Feet and there is an optional Leather Sheath available. Size: 8" x 3" x 0.375"
10” x 4” Dia-Sharp® Whetstones. Single Sided. These have the largest sharpening area on the market and are great for those of you who like to sharpen on a “football field”! They are great for sharpening big plane irons and chisels, for example if you’re into green woodworking with oak beams, timber frame buildings etc.They come with Non Slip Feet and there is an optional Leather Sheath available. Special order only. Size: 10" x 4" x 0.375"
11” Dia-Sharp® Whetstones. Single Sided. and for those of you who like to sharpen over a long surface. They come with Non Slip Feet and there is a optional Leather Sheath available. Size: 11.5" x 2.5" x 0.375"
Leather Sheath, Honing Paste, 8x Magnifier & Staedtler Eraser to clean the Whetstone. for only £16.46 by quoting Code: D11SD at checkout. It’s really handy to slot your 6” Whetstone into the top of a DMT® DuoBase™. It keeps your fingers away from the bench making sharpening easier. This 8” Whetstone comes with a bench mount tab and screw hole at each end.